Where would you rather be right now? Charging down a dirt road, 5th gear pined? Conquering terrain where few have gone before? Would you rather be blazing trails with like-minded riders? Then adventure riding on a KTM is the place for you! 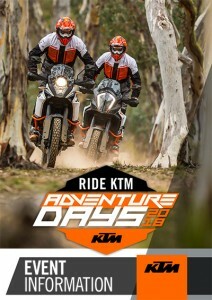 An event for you to experience all things KTM ADVENTURE! Registration costs $50.00, which gives riders two demo rides on MY18 KTM Adventure models of their choice, a KTM goody bag, a chance to take part in seminars on a variety of topics – from what to pack, what tools and spares to have and the best riding gear options – plus riding tips from specialised adventure coach Nick Selleck and information on KTM adventure events and adventure coaching that is available. And it’s the people behind the brand that help make KTM ADVENTURE what it is – so not only do those attending get all of the above, but they also get to meet and hang with KTM special guests Toby Price (VIC, NSW) and Adam Riemann (QLD)! 3 events. One Purpose. Introduce riders to the KTM way of adventure!